Las Vegas, NV – we at MMHR were able to observe Championship Saturday at the 2nd Annual Jerry Tarkanian Classic hosted by Bishop Gorman High School. As a former AAU, high school, and junior college coach, Jerry Tarkanian has influenced my coaching philosophy and style like no other coach. From trying to run his famed “amoeba” defense to his exciting fast break offense, Coach Tark is one for the ages. 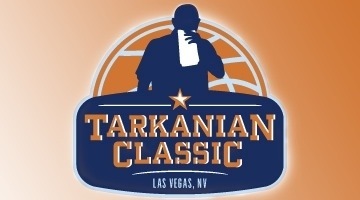 No one is more deserving of a basketball tournament named after him than Coach Jerry Tarkanian. The Tarkanian Classic featured 32 teams in attendance from all over the country gathered in Las Vegas, the games played on Championship Saturday gave a crystal ball look into the the Class of 2016 and 2017. I remember the first time I saw Derryck Thornton Jr.(2016), point guard at Findlay Prep (NV), play It was at the 2012 Pangos All American Camp. He was in the 8th grade at the time. Derryck was able to compete against the older players in the camp, but I did not see anything special about him. Fast forward a year and a half later, there was not enough superlatives to describe Derryck’ performance at the Jerry Tarkanian Classic. On the offensive end, he is very poised. Derryck has a great handle with both hands which prevents him from being pressured. His court vision allows him to make great passes to teammates at the right time. Off the ball, Derryck is a knockdown 3 point shooter with great range and consistency. On the ball, he gets separation that leads to making shots such as a step back 3 pointer. On the defensive end, Derryck is a pitbull on ball defender, anticipates where the ball will be before it gets there, and gets into the passing lanes for steals. Throughout the game, he encourages his teammates, shows leadership, and quarterbacks the game. Friday in a 3 point loss (70-67) to Prime Prep (TX), Derryck had 14 points(6-12 FGs), 5 rebounds, and 3 assists. On Saturday in another close loss(63-61) to Montrose Christian(MD), Derryck was even more efficient He had 14 points(5-5 FGs), 3-3 on 3 pointers, 3 assists, 3 steals , and 2 turnovers. I feel I witnessed the best guard in the 2016 class nationally.